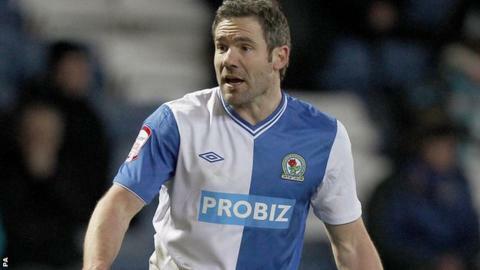 Goals from David Dunn and Grant Hanley maintained Blackburn's play-off hopes and extended managerless Blackpool's winless run to 12 Championship games. Veteran midfielder Dunn opened the scoring in the first half with a left-foot shot from the edge of the area. Blackpool's Chris Basham forced home keeper Paul Robinson into a save while Stephen Dobbie also went close after a fine run and shot. But Hanley sealed victory when he headed home a corner late on. It was Rovers' first win in five matches and keeps them five points behind sixth-placed Reading, who enjoyed a 3-0 victory at Millwall. Blackpool, who sacked boss Paul Ince in January, could have taken an early lead when an unmarked Isaiah Osbourne headed over the bar, and they were made to pay for that missed chance when Dunn picked up the ball 30 yards out and advanced forward before firing home. Basham's 30-yard effort caused Robinson a nervous moment while striker Steve Davies found the side-netting for the Seasiders after spinning in the area. But the hosts had further chances, both Jordan Rhodes and Rudy Gestede trying their luck with headers, and it was no surprise when Rovers doubled their lead. Moments after Blackpool substitute Dobbie had jinked into the area and seen a left-footed shot deflected over the bar, Hanley headed Craig Conway's corner into the ground and over Matt Gilks to seal all three points. "It was important that we turned our performances into wins and we're delighted that we've done that. "I thought it was a very professional job today. Barry Ferguson's got them fighting for their lives and it took a bit of brilliance from David Dunn to unlock them but we felt we should have been more up with the possession we had in the first half, been more clinical but in terms of the performance, very professional." "I sat down in the dressing room and I said to the players, 'if you look through our squad and you add Ricardo Fuller and Jack Robinson to that, I'd take that squad over anybody's'. "All they need is a bit of belief and I need to spend a bit of time with them. "I think it's a quality squad and I think it's good enough without a doubt, and they need to believe in that. I wouldn't be sat here if I wasn't confident that I could do it." Match ends, Blackburn Rovers 2, Blackpool 0. Second Half ends, Blackburn Rovers 2, Blackpool 0. Delay in match Thomas Spurr (Blackburn Rovers) because of an injury. Thomas Spurr (Blackburn Rovers) wins a free kick in the defensive half. Dangerous play by Faris Haroun (Blackpool). Attempt missed. Jordan Rhodes (Blackburn Rovers) header from the centre of the box is too high. Assisted by Craig Conway with a cross. Substitution, Blackburn Rovers. Markus Olsson replaces Joshua King because of an injury. Offside, Blackpool. Andrew Keogh tries a through ball, but Steve Davies is caught offside. Rudy Gestede (Blackburn Rovers) wins a free kick on the left wing. Foul by Kirk Broadfoot (Blackpool). Attempt missed. Steve Davies (Blackpool) left footed shot from outside the box is high and wide to the left from a direct free kick. Foul by Matthew Kilgallon (Blackburn Rovers). Steve Davies (Blackpool) wins a free kick in the attacking half. Goal! Blackburn Rovers 2, Blackpool 0. Grant Hanley (Blackburn Rovers) header from the centre of the box to the top left corner. Assisted by Craig Conway with a cross following a corner. Corner, Blackburn Rovers. Conceded by Faris Haroun. Attempt blocked. Rudy Gestede (Blackburn Rovers) right footed shot from outside the box is blocked. Assisted by Jordan Rhodes. Attempt blocked. Craig Cathcart (Blackpool) left footed shot from the centre of the box is blocked. Substitution, Blackpool. Nathan Tyson replaces Chris Basham. Corner, Blackpool. Conceded by Matthew Kilgallon. Attempt blocked. Steve Davies (Blackpool) left footed shot from outside the box is blocked. Assisted by Stephen Dobbie. Attempt missed. Gary Mackenzie (Blackpool) header from the centre of the box is high and wide to the left. Assisted by Stephen Dobbie with a cross. Corner, Blackpool. Conceded by Jason Lowe. Attempt blocked. Stephen Dobbie (Blackpool) left footed shot from outside the box is blocked. Assisted by Andrew Keogh. Rudy Gestede (Blackburn Rovers) wins a free kick in the attacking half. Attempt missed. Rudy Gestede (Blackburn Rovers) header from the centre of the box misses to the right. Assisted by Todd Kane with a cross. Foul by Joshua King (Blackburn Rovers). Joshua King (Blackburn Rovers) wins a free kick on the right wing. Foul by Isaiah Osbourne (Blackpool). Corner, Blackburn Rovers. Conceded by Kirk Broadfoot. Substitution, Blackburn Rovers. Joshua King replaces Chris Taylor. Substitution, Blackburn Rovers. Craig Conway replaces David Dunn. Attempt missed. Anthony McMahon (Blackpool) right footed shot from outside the box is close, but misses to the right. Assisted by Andrew Keogh.